Posted January 4, 2007 in 2007/01, Comicscope, Topic, z Archive. I previously posted on the part that the Comicscope played in the early copying of Captain Freedom from Captain America. But in that post I was still left with a question about how the owner’s of Comicsope got an image of Captain America before the release of his first issue. In the light of new information I will be reviewing the entire issue again but for those interested in what I had to say originally here is a link to my previous post. 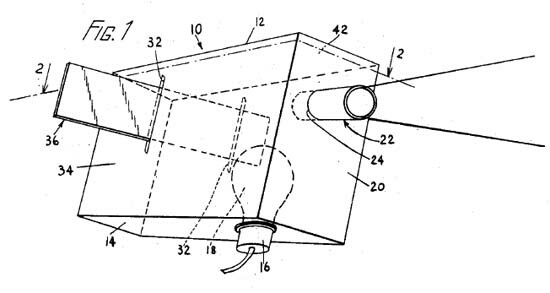 The Comicscope was the creation of Victor Fox and Bob Farell, or at least they filed for the patent. 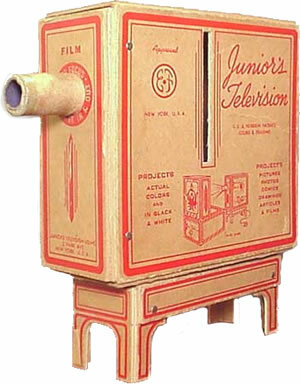 If you are interested it how the Comicscope actually worked please see another post that I wrote, there is no reason to repeat that here. Victor Fox was the owner of Fox Comics and Bob Farell has been described by Joe Simon as Victor’s right hand man. However the Comicsope business was separate from Fox Comics. 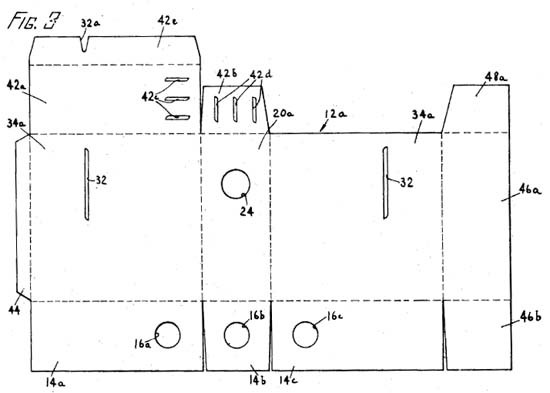 If I read the patent correctly, Victor handed off the rights to the Comicsope to Bob. Still as they were involved with both enterprises, it is not surprising that there was a special relationship between Fox Comics and the Comicsope. Early advertisements for the Comicsope that appeared in Fox Comics were actually promotions for those comics. Kids who wanted to get a Comicsope had to send in not just money, but also coupons clipped from five different Fox Comic titles. 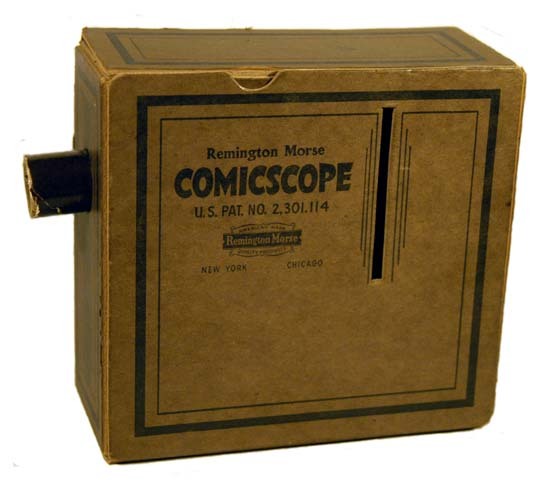 This promotional aspect of Comicscope ads disappeared in later issues of Fox Comics. Joe Simon has said that Comicsope received free advertisements in the Fox Comics. Note that in the ad shown above image projected on the wall is of Samson, one of Fox Comics characters. This makes sense since the whole purpose of the Comicsope was to project comic images and what better image to show then that of a Fox Comic hero. As I said the Comicsope was really not part of Fox Comics so it is not surprising that they might want to advertise it in the comic books of other publishers. One was Martin Goodman’s publishing company which today is referred to as Timely. But is understandable that Timely might object to a advertisement that included an image of another company’s hero, in this case Samson. So the ad was reworked to include Timely heroes. 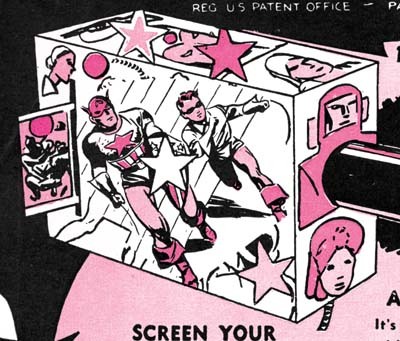 In the advertisement above you can see Captain America has been placed on the side of the Comicscope. This was done rather crudely with parts of previously images still showing. The image of Samson being projected was also replaced. 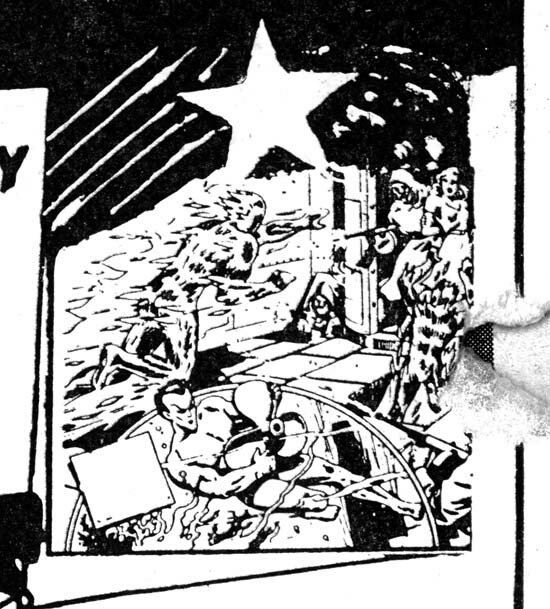 It is a little hard to make out in the scan of the entire page above, but as you can see in the close-up below the new projection is of the Human Torch and the Sub-Mariner. The Comicscope ad that I show above is the new information I mentioned at the beginning of this post. It is from the inside front cover of Daring Mystery Comics #7 (April 1941). Daring Mystery was one of Timely’s less successful titles. It was supposed to be a monthly publication, but in fact its schedule was rather sporadic. 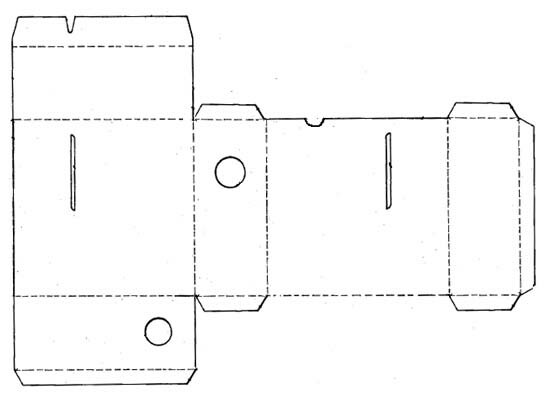 The previous issue (#6) was cover dated September 1940. So although the ad was actually published after the release of Captain America Comics #1 (March 1941) work on it may have begun much earlier. 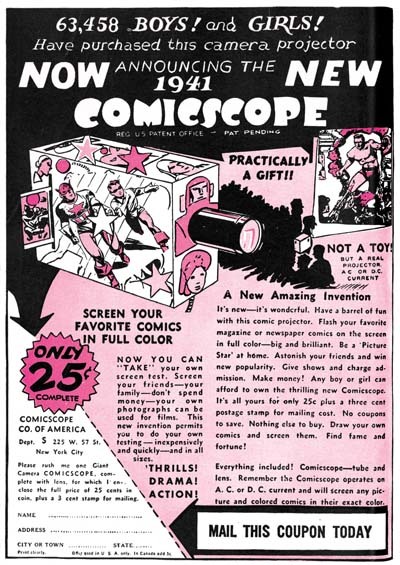 There are good reasons to believe that this Comicscope ad was done earlier then indicated by its cover date. The version of Cap portrayed is that used for the first issue, notice the triangular shield and “skull cap” headpiece. These features were changed for all subsequent Captain America Comics, including that for issue #2 that also was cover dated April. The projection of the Human Torch and Sub-Mariner includes Toro. Toro was introduced in Human Torch Comics #2 (Fall 1940). Farell would also go to Irving Manheimer to have his Comicscope advertisement placed. Irving Manheimer was president of Publisher Distributing. Although Manheimer’s business mainly dealt with distribution he also published a few comic book titles, including Speed Comics. 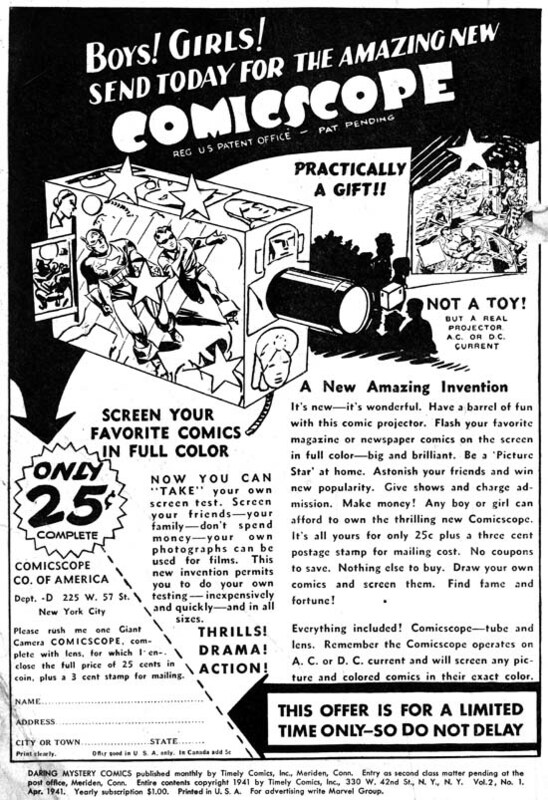 The Comicscope advertisement would appear in Speed Comics #13 (May 1941). Once again the ad was altered, returning Samson as the projected image replacing Timely’s Human Torch and Sub-Mariner. 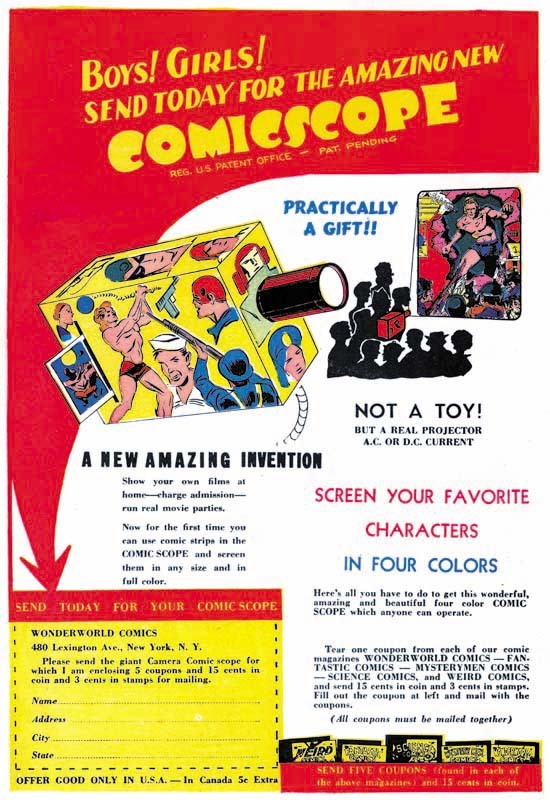 But the image of Captain America on the side of the illustrated Comicscope remained in the ad. While the Timely ad was in black ink only, the Speed advertisement was printed in two colors (black and magenta). Notice that the colorist, working without a color guide, made a mistake in Captain America’s uniform. Flesh color was added to the legs. Presumable the colorist mistook Cap’s shorts to indicate that he had bare legs. Unlike Goodman, Manheimer was probably not bothered by showing other comic publisher’s heroes in the Comicsope advertisement. In fact it looks like he took advantage of the information he gained from the ad. For Speed #13 was also the issue where Captain Freedom was introduced. The correspondence between Captain America and Captain Freedom is obvious. Similar placement of red and white stripes, a circle of stars replaces a single star on the chest, and shoulder pads replace mail armor. The “skull cap” is similar particularly to the Cap in Captain America #1. And of course the rank of Captain is shared by both. 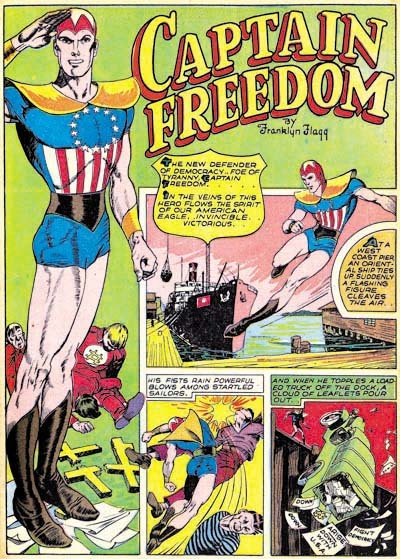 Captain Freedom also has bare legs, but this is only in common with the mistaken colorist’s rendition of Captain America for the Comicsope advertisement. Captain America Comics #1 has a cover date of March while Captain Freedom starts with a cover date of May. It took at least three months to get a comic book published; one month month or more working on the art, a month for printing and a month for distribution. That being the case Captain Freedom was created at least a month before Captain America Comics #1 hit the stands. But with knowledge gained from the Comicsope ad, Manheimer would be able to get a jump on the competition and produce his own Captain America knock-off. Irving Manheimer would shortly sell off his comic titles to Al Harvey. Al Harvey was a good friend of both Joe Simon and Jack Kirby. In fact Harvey had asked Joe Simon to come join him and invest in his new publication company. Joe declined, he probably felt he would do better with the share of the profits from Captain America that Martin Goodman promised him. But the promise was not fulfilled and Simon and Kirby would eventually leave Timely to go to work with DC. But they also did some moonlighting, including doing some covers for Harvey’s comics. It is one of those ironies that having created the phenomenal Captain America, Joe and Jack would end up doing some of the best art for Captain Freedom, a knock-off of their own creation. Posted April 17, 2006 in 2006/04, Comicscope, Harvey Covers, Topic, z Archive. What makes the similarity surprising is the Captain America #1 was cover dated March while Speed #13 is dated May. According to Joe Simon, comics typically took about a month to create, a month to print, and another month to distribute. But that would put the creation of Speed #13 to at best a month before Captain America #1. So we seem to have a case of an obvious copy-cat patriotic hero created before the original hit the new stands. How was that possible? I think part of the answer lies in a adverisement on the back cover of Speed #13. 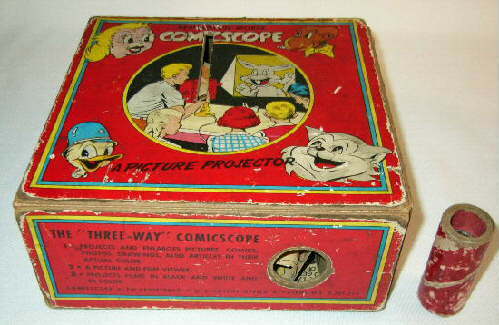 If you missed it, below is a close up of the comicscope. On the sides is a clear depiction of Captain America and Bucky. If maybe a little hard to notice because it is behind a star, but Cap carries his triangular shield. Further Cap is wearing his original “skull cap”, with his neck bare. Interestingly, Cap and Bucky are mistakenly depicted as wearing shorts, just like Captain Freedom. A similar ad, without Cap, was on the back of Speed #12. Cap and Bucky were crudely pasted over the original ad’s art, parts of which are still visible around the edges. With the placement of this ad in the same issue, and presumably with an explanation of who the hero was, Manheimer had advance notice of Captain America. He therefore could respond with the creation of their own patriotic hero. But having answered what source Manheimer used to launch Captain Freedom, we now have to wonder how the comicscope ad could have known about Simon & Kirby’s creation? Comicsope was the invention of Bob Farrell, who was Victor Fox’s right hand man. According to Joe, Farrell got free advertisement for comicscope in Fox comics. That is Fox’s Samson that is being projected on the wall in the ad from the Speed #13. But according to Joe, he never saw Bob Farrell for a number of years once he (Joe) left Fox Publications. So how Bob Farrell got to see Simon & Kirby’s new creation before it was published remains a mystery. 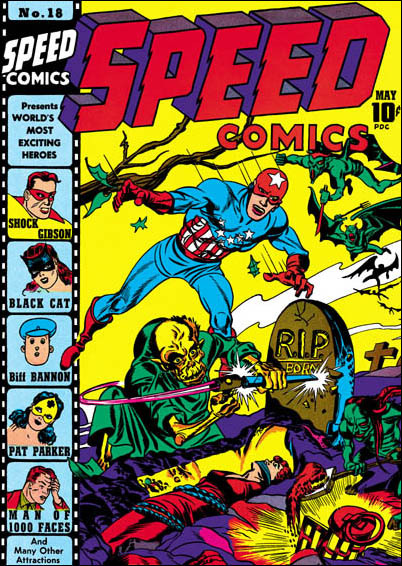 This Speed #18 cover was primarily penciled by Jack Kirby.